Windows | 41 Lumber - Serving Iron Mountain and the U.P. Natural light sets a room’s atmosphere and windows are the central feature in obtaining the desired vision for your home. Our Team will guide you through the selection process to create a functional and personalized look for your home. We will take measurements of your openings to ensure the windows will be an exact fit. Whether it is new construction or replacement windows, our Team has the knowledge to assist you in the process and answers all of your questions. We offer a broad choice of Pella, Windows by Unlimited, and Kolbe & Kolbe windows. From wood to vinyl to aluminum clad, we have the right window for your project and budget. Our buying guides for replacement and new construction windows offer helpful considerations to get your project started on the right foot. 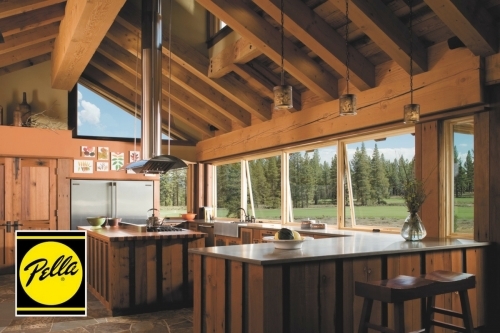 Builders, remodelers, and homeowners alike choose and trust 41 Lumber for replacement and new construction windows. From start to finish, windows to trim, 41 Lumber is your source for windows. We offer a wide variety of insert and replacement solutions for all types of openings. There are a number of things to consider before replacing a window, including whether or not you are planning to replace the interior mouldings, replace the exterior siding or trim, or none of the above. Replacing old windows is a valuable investment in your home. You will increase your curb appeal while saving money on your heating and cooling costs. Visit one of our six locations and our Team will ensure you find the right product to create your vision and that is most cost effective for you. We offer a wide variety of options for new construction windows in wood, vinyl, fiberglass and aluminum clad. Your vision will come to life with nearly unlimited options of shapes and sizes. Our complete line of windows offers the flexibility for design. Builders will appreciate the ease of installation and homeowners will enjoy the easy maintenance, energy savings and gorgeous views. Visit any of our six locations for project inspiration. 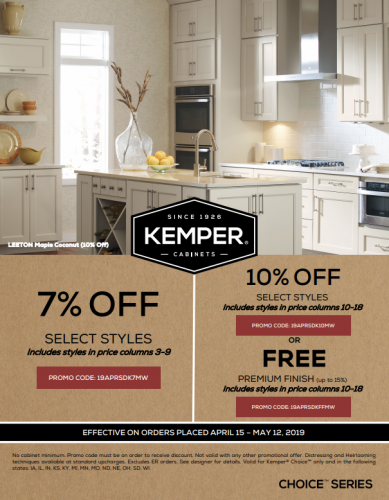 Save on Kemper Cabinet orders placed 4/15/19 - 5/12/19 * 10% Off styles priced in columns 10-18 * 7% Off styles in price columns 3-9 View Flyer Not valid with any other discounts or sales.